An Educational Solution or a Political Attack on Public Education? · What is the impact of closing schools on students, parents and teachers? 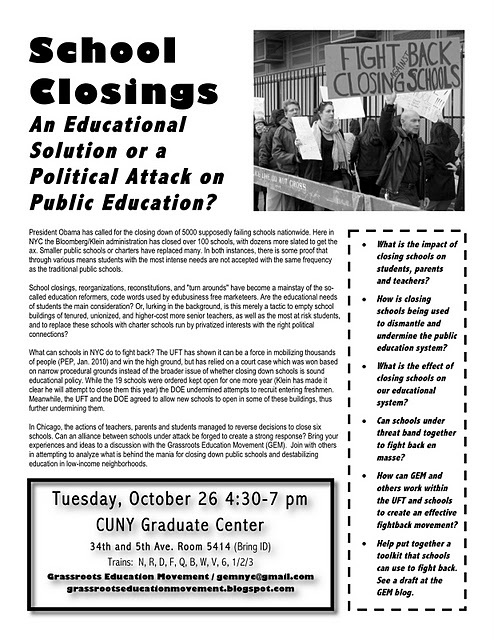 · How is closing schools being used to dismantle and undermine the public education system? · What is the effect of closing schools on our educational system? · Can schools under threat band together to fight back en masse? · How can GEM and others work within the UFT and schools to create an effective fightback movement? · Help put together a toolkit that schools can use to fight back. See a draft at the GEM blog. President Obama has called for the closing down of 5000 supposedly failing schools nationwide. 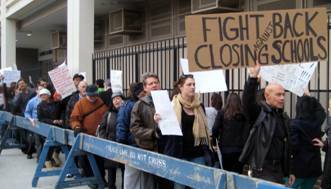 Here in NYC the Bloomberg/Klein administration has closed over 100 schools, with dozens more slated to get the ax. Smaller public schools or charters have replaced many. In both instances, there is some proof that through various means students with the most intense needs are not accepted with the same frequency as the traditional public schools. School closings, reorganizations, reconstitutions, and “turn arounds” have become a mainstay of the so-called education reformers, code words used by edubusiness free marketeers. Are the educational needs of students the main consideration? Or, lurking in the background, is this merely a tactic to empty school buildings of tenured, unionized, and higher-cost more senior teachers, as well as the most at risk students, and to replace these schools with charter schools run by privatized interests with the right political connections? What can schools in NYC do to fight back? The UFT has shown it can be a force in mobilizing thousands of people (PEP, Jan. 2010) and win the high ground, but has relied on a court case which was won based on narrow procedural grounds instead of the broader issue of whether closing down schools is sound educational policy. While the 19 schools were ordered kept open for one more year (Klein has made it clear he will attempt to close them this year) the DOE undermined attempts to recruit entering freshmen. Meanwhile, the UFT and the DOE agreed to allow new schools to open in some of these buildings, thus further undermining them. In Chicago, the actions of teachers, parents and students managed to reverse decisions to close six schools. Can an alliance between schools under attack be forged to create a strong response? Bring your experiences and ideas to a discussion with the Grassroots Education Movement (GEM). Join with others in attempting to analyze what is behind the mania for closing down public schools and destabilizing education in low-income neighborhoods.